Late on Friday night BP began to try inserting a narrow pipe into the remnant of the riser lying on the sea bed at the site of the Deepwater Horizon site in the Gulf of Mexico. Because there is a better illustration of the process that they are using, I am adding this as a separate post, rather than an addendum to the last one on this topic. Technicians have fully inspected the system and have re-inserted the tool. The tool is fashioned from a 4-inch pipe and is inserted into the leaking riser, from which the majority of the flow is coming. While not collecting all of the leaking oil, this tool is an important step in reducing the amount of oil being released into Gulf waters. The procedure - never attempted before at such depths - involves inserting a 5-foot length of the specifically-designed tool into the end of the existing, damaged riser from where the oil and gas is leaking. In a procedure approved by federal agencies and the Federal On Scene Coordinator, methanol will also be flowed into the riser to help prevent the formation of gas crystals, known as hydrates. 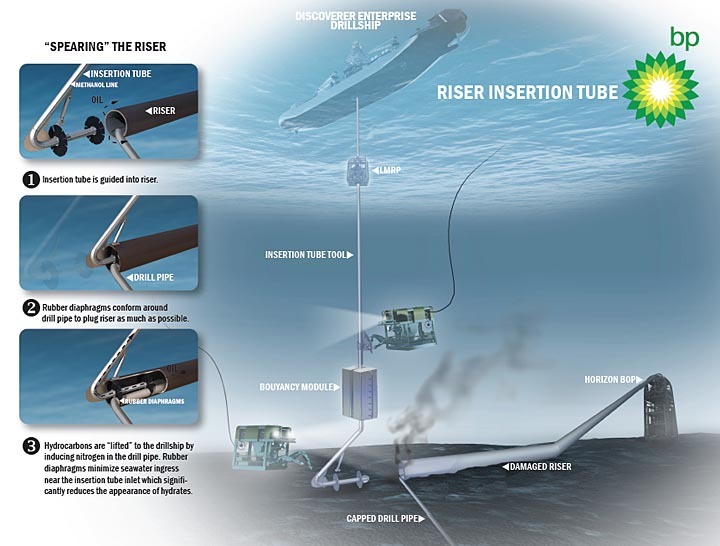 Gas and oil will then flow to the surface to the Discoverer Enterprise drillship. The initial attempt to get the "needle" into the pipe was called off when the equipment shifted in the supporting frame. It is, however back on the seabed, and the attempt to insert it, collect the oil and gas and bring it to the surface, should start later this evening. The problem arose because the pipe that will carry the oil and gas back up to the ship at the surface (which they confusingly also call the drill pipe) has to mate with the insertion tool which is held in the frame (I imagine this includes the buoyancy module shown) at the seabed. It was the connection to the drill pipe to the ship that could not be made, so they took the assembly back to the surface, and fixed the problem. They are now (late Saturday afternoon) getting ready to make an insertion into the broken riser. The drill pipe is to be "stabbed into" the frame, and the intent is to eliminate any water getting into the connection, to eliminate the hydrate problem. At the moment they have also started a continuous injection of dispersants underwater, after the three tests were judged to be successful. This has reduced the work needed to control the oil spread on the surface. They pointed out today that the dispersants that they are using were pre-approved before the spill and this had been approved in a more limited application, but after the tests were successful, is now approved for use underwater - which actually reduces the amount needed since it is injected into the heart of the spill, rather than spread over the surface after the oil has migrated upwards. They are, however, becoming a little more concerned about the weather, since changing conditions have made it more difficult to control the spill, since it is currently too rough for skimming and controlled burns - though that may improve in the next couple of days. They are running the riser and BOP on the first relief well today (it is already about half-way down to TD), and they should spud the second relief well almost immediately. (And I note that in the press briefing Secretary Salazar repeated the line used by Secretary Chu in the past, that his folks are "the smartest people on the planet!" Sigh! Even if they are, you cannot bring folks up to speed on all the ramifications and complexities of deepwater oilfield technologies in a couple of days, it is a blindness to reality I have commented on before, but let me get off that soap box). HO - your posts & comments are highly informative and much appreciated. Can I ask for your help in understanding the "negative test" run before the blow out? It seems to be fairly important -- maybe worth a separate post. It is fairly easy to understand a positive test on the final production casing string. Pump up the pressure inside the string; hold that pressure for a period of time; see if there is any pressure bleed off -- if there is no pressure bleed off, then no fluid is leaking out of the casing & it passes the test. It is less easy to understand a negative test, which should have shown if any fluid was leaking into that production casing. How does the operator lower the pressure inside the casing? What is the pressure on the outside of the casing, and is that measured? The House Hearing on May 12 included a BP e-mail specifiying the negative test procedure, but it is not self-explanatory. Can you walk us through how a negative pressure test is conducted in an offshore well? I will write a separate post on this. It will follow one of the tech talks I am putting together at the moment (which has some relevance) before putting it up - -probably later tonight, since I would also like to catch what is said at the Press release later this afternoon.